This month has seen a little "joining" frenzy as customers and fans of Stampin' Up! products have been taking advantage of the July joining offer, whereby you pay £99 to join and select your own customised kit worth £130 PLUS you can select one complete colour family of inkpads (10 per colour family) COMPLETELY FREE (worth £63) ! However, time is fast running out as this promotion ends on 31st July. Anyway, I was very honoured to have been joined by Maddy this week, which was a lovely surprise. Like all members who join my team, Maddy will be receiving a Welcome Gift from me as a little "Thank You". 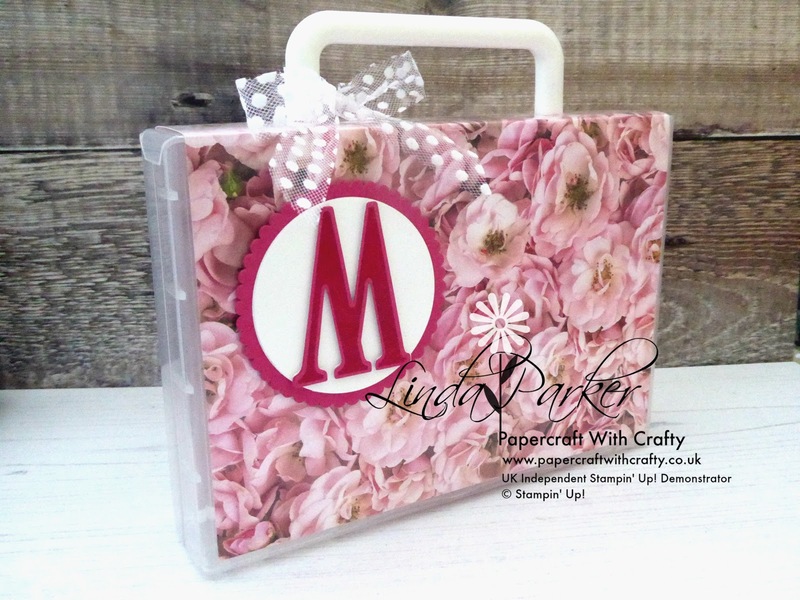 My Welcome Gift is one of these gorgeous gift cases which I customise by adding these cute little handles (I buy mine from B&Q). I love the Petal Promenade Designer Series Papers and decided to use it for Maddy's case. I think it looks really pretty and feminine. I like to add a few little extras such as a covered notepad in the same DSP and a prettily packaged chocolate bar (in this case a Ripple). These handy little cases make great stocking fillers at Christmas, sweet birthday presents and also brilliant items to sell at Craft Fayres. So lots of possibilities for them. Hope you like my little cases and that you may be inspired to have a go yourselves. Thanks for looking - and please pop back. Ms. Linda as always your case is wonderful. I hope one day that I can come from the U.S. to receive a in person class from you. Or if you ever come to the U.S. let me know, I would love to meet you. Thank you for always being so generous with your time.